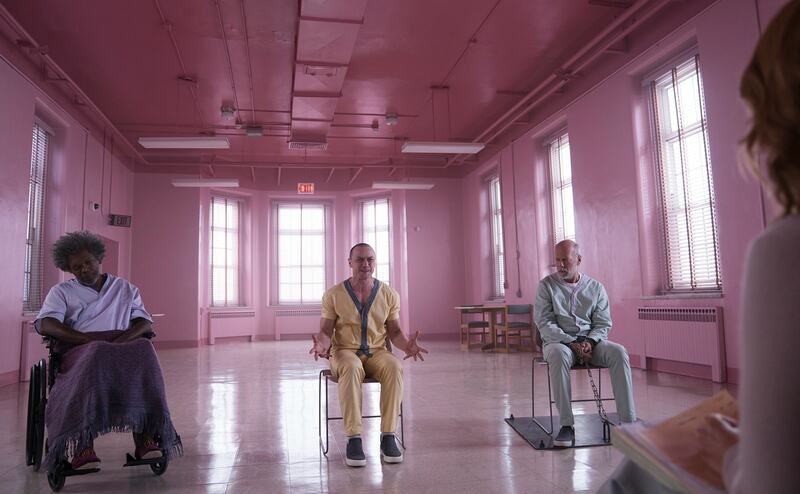 M Night Shyamalan had set himself a difficult task with Glass. Unbreakable was a great movie that people wanted a sequel to, so he linked the seemingly stand-alone (and equally as brilliant) Split to the same “universe.” This meant that audiences were now on tender-hooks waiting for the moment that Bruce Willis’ indestructible superhero met James McAvoy’s super-human “Beast.” Except, this could only be one scene so what could the rest of the movie be? This could have been answered many ways by the numerous fans waiting for this movie which means Shyamalan will always have disappointed some people. What he actually delivers is a very complex, tense and in-depth look at superheroes, comic books and an individual’s psyche and their potential delusions of grandeur. What this means though, is that the middle act of the movie is a very talky, therapy led look at the three characters which have made these movies so compelling. Luckily, each of the characters are so compelling and each actor brings their skills back to the trilogy-ender. Bruce Willis’ character has the least to do dramatically, other than react shocked, angered or desperate. His action skills are brought into play here though and that will always be a strength. Samuel L Jackson doesn’t exactly get much to do either but comes into his own for the third act. The real star is James McAvoy once again. Returning to one of his best roles, he arguably has much more to do here. He has to quickly switch between each separate identity but they never feel like they mix: McAvoy manages to give each one a clear persona of their own. It is also a much more physical performance than Split. “The Beast” is seen far more here and McAvoy brings the character to life in pure terror, anger and animalistic behaviour. Whenever “The Beast” is on-screen you can feel the tension and fear for anyone sharing the scene with the character. In fact, Shyamalan manages to stage plenty of these tense exchanges, from a cheerleader rescue to open the movie through to the plenty of edge-of-your-seat moments when our three protagonists are locked in the same facility. It is these moments which help to keep the middle act so intense but interesting. The characters unfold and questions are asked about whether “superheroes” actually exist. It begins to play with what is presented in both Unbreakable and Split and could have gone down a very interesting route as it dissected and unfolded the idea of “real-life superheroes.” Unfortunately, this isn’t explored enough and instead the finale feels much more like a classic superhero story after-all. Which means Shyamalan has to deliver the showdown the movie teases throughout. It doesn’t disappoint and uses plenty of clever twists, staged moments and set-pieces to keep it from being a simple punching match. Glass manages to deliver a “realistic” superhero movie while still making it feel like it is good facing evil. Shyamalan even manages to slip in a few cool one-liners and great superhero call-backs as well. As for matching the previous two films? It is difficult to say. Glass does a great job of bringing the world’s together and the characters each have their place. There is a mythology that some actual superhero franchises would be proud of and “twists” galore in the final moments. Unfortunately, it never really delivers on the promise of an Unbreakable sequel or the meeting of movie characters that Split hinted at… could it ever have though? Overall, Glass is a fitting close to the Unbreakable and Split trilogy but doesn’t live up to the promise. It is an interesting look at superheroes and psychology while also being filled with plenty of cool, tense and action-packed moments. McAvoy steals the movie but Glass doesn’t quite deliver what a lot of people probably wanted. Could this film have ever been what the fans wanted?